Florida is on the cusp of a historic moment. Democratic voters nominated Tallahassee Mayor Andrew Gillum as the first black candidate for Governor in the history of the state. As important is Amendment 4, a ballot initiative that would restore voting rights to 1.5 million Floridians who are disenfranchised due to Jim Crow style era laws that disproportionately target black citizens. 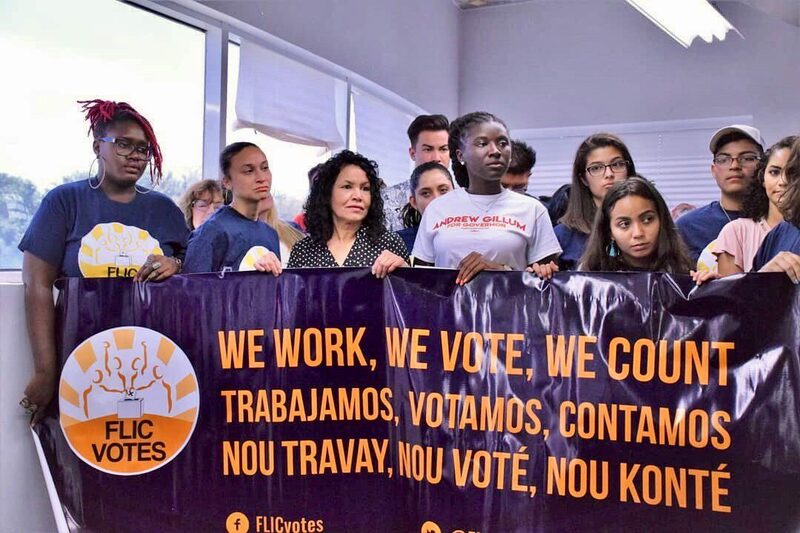 Gillum supports restoring voting rights for disenfranchised Floridians, reversing a long history of keeping people of color from the ballot box. Felony disenfranchisement dates back to the aftermath of the civil war, it was reintroduced in 1968 as part of the white-led backlash to the civil rights movement, as a method to suppress the votes of black people after the passage of the civil rights act. Previous Governors Charlie Crist and Jeb Bush had relaxed rules making it easier for people to get their voting rights restored, but current Governor Rick Scott changed the rules to make it close to impossible. Under the current system, people have to wait up to seven years from the time they complete their sentence in order to apply for their voting rights to be restored. They eventually have to appear in front of Scott himself and the rest of his cabinet in order to make their case. This clemency board meets only four times per year and it can take years to get an appointment. Out of the three states that strip lifelong voting rights from people with felony convictions, Florida has by far the largest population of people directly impacted by these voter suppression tactics. Ten percent of the overall voting population was blocked from voting in 2016 and one out of five eligible black voters in Florida currently cannot cast a ballot because of this form of voter suppression. Mass incarceration is what funnels people of color into this voter suppression machine in Florida. The prison population in the state rose by 14 percent from 2000 to 2015. Out of the 50 states in the United States, the Florida Department of Corrections has the third largest prison system, with 100,000 people behind bars. The system is broken and out of control. If you are a Florida resident, there is a good chance that you know somebody who has been through the criminal injustice system in the state and is currently barred from voting as a result. It could be your parent, sibling, uncle, cousin or friend. Their vote might be stripped away potentially for a lifetime because they drove with a suspended license or got caught with the wrong amount of marijuana. This November, Florida voters will not only have a chance to do away with this Jim Crow era holdover by passing Amendment 4, but also to elect Florida’s first black governor in Mayor Andrew Gillum. For most of the gubernatorial campaign, Gillum’s campaign raced little money. Instead of spending his little resources in paid ads, he invested heavily in grassroots organizing and met with groups on the ground, no matter how small. His strategy seemed to have paid off after beating four primary opponents, all millionaires except himself. Gillum has a genuine working class background. He is the son of a bus driver and a construction worker, the fifth of seven children and first to graduate from college. He is a strong supporter of Amendment 4 and has suffered personally from felony voter suppression, as his own brother is disenfranchised by the ban. On November 6th we can take a monumental step forward in addressing racial justice in the state by electing Andrew Gillum as our governor and expanding our Democracy by passing Amendment 4. We can steer which way Florida goes at this historic crossroads.